NDT Introduction:- Non Destructive Testing (NDT), Non Destructive Evaluation (NDE) and Non Destructive Inspection (NDI) are the terms used to represent the techniques that are based on the application of physical principles employed for the purpose of determining the characteristics of materials or components and for detecting and assessing the inhomogeneities defects without destructing such materials or components.
" Water coupling eliminates the variability associated with contact coupling.
" High frequencies, up to 35 MHz can be used.
" High resolution Scan up to 0.1mm step for C-scan imaging.
" Scanning Area 900mm x 700mm x 700mm.
" A 6-axis manipulator for maneuvering the probe head. 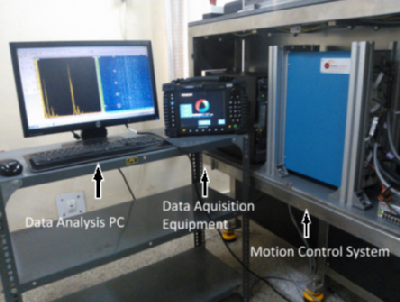 The system shown in Figures has high frequency capability (25MHz), enabling extremely fine focusing. The pulser/receiver operate under the control of Tomoview software. This collects the entire waveform and enables the data to be presented in a variety of views (plan, cross-section, etc.). The probe manipulator has 2 degrees of freedom. Horizontal IRIS (Internal Rotary Inspection System) has been developed and which is being used to inspect a PFC Mock-up assembly of length 500mm to detect bonding defects. The tank can accommodate components that are up to 0.7m x 0.9m. 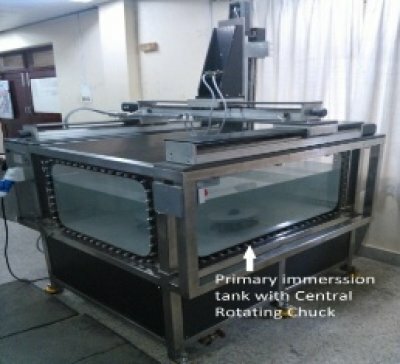 The system is equipped with a dedicated ultrasonic data analysis system (Tomoview), together with integral scanner controllers designed by Trotix Ltd. (IIT-Chennai). Non Destructive Testing is widely used to examine materials during the manufacturing or in process. In this context, simulation of NDT plays an increasing role for conceiving methods, demonstrating their performances at a low cost and so on. As simulation permits to master the parameters involved during an examination, it is a crucial factor to increase inspection reliability. 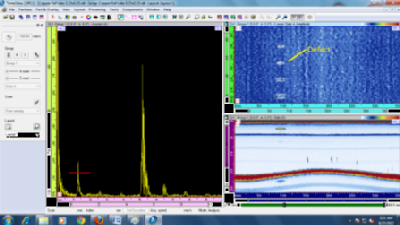 CIVA-UT is the simulation software for ultrasonic testing and CIVA has been developed by CEA (French Atomic Energy Commission).High Temperature Technologies Division (HTTD) has CIVA 10.1 which is the latest version of this software. This software has been applied to real ultrasonic testing. 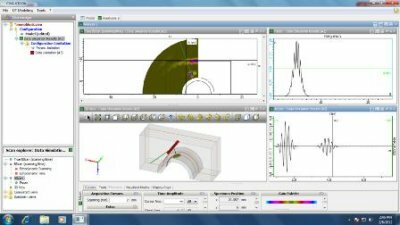 Simulation capabilities of this software include calculation of ultrasonic fields in different geometry of components, interaction between ultrasonic fields and flaws and calibration of defects such as spherical pores, side-drilled holes, flat-bottom holes etc. in isotropic or anisotropic Materials. 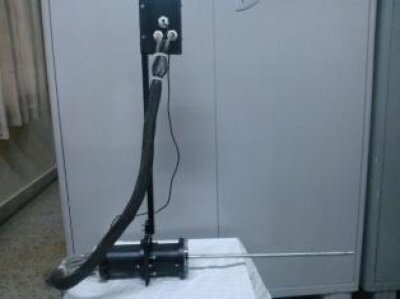 Divertor Components contained complicated geometry and ultrasonic testing of such components implies challenging task, CIVA-UT helps us to simulated testing of these components with possible parameters like selection of probes and testing procedure to obtained faithful inspection.